carlyklock: Bess, bijin, and beautiful hair! Bess, bijin, and beautiful hair! I got my hair done on Saturday. I love, love, love it when that day rolls around. I go to bijin salon & spa, which is approximately 94.67 seconds from my house in the Village. Bess does my hair there. She is awesome. I had to 'downgrade' to Studio B when we bought our house, but I think I actually wound up upgrading because Bess is so fabulous. Which means it's only inevitable that she migrates to the 'main salon' sooner than later. I choose not to think about that day. This last time I went I allowed myself to buy product (and during the holiday season, no less!) My buyer's remorse was virtually wiped away as soon as I used the stuff, though. (phew) I'll go ahead and share what I got so that you go out and buy some, too. That oughta get rid of the remaining glint of buyer's remorse (hey - you did it). My hair needs product. It needs heat and some serious TLC. It needs to be tamed. And this protection milk from Kerastase does some cuticle smoothing, but most importantly really seems to protect my hair from all that heat. Oh! And it protects my color, too. Totally makes it a sound investment. The other item that wound it's way into my home is Bumble and bumble's brilliantine. Which just so happens to be the first product that they ever made (Bb started out as a salon). Hair stuff and a piece of history! I really love this brand. I wish my savings account did, too. It seems to say nothing, yet everything. brilliantine really helps get my curls under control without making them too controlled. Ya know what I mean? And when I blow my hair out, it gives me some texture, especially at the ends. Get you some Bb! 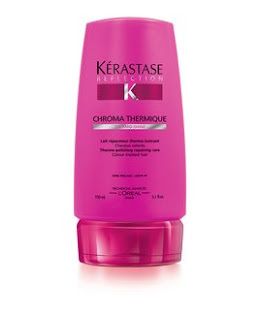 And, if you go to bijin, say yes when the offer you a Kerastase conditioning treatment. You owe it to yourself at least once, believe me.